As a Career and Technical Educator, equipping students with career-readiness skills, like communication, problem-solving, and collaboration, is my first-order priority in the classroom. While these skills focus on preparing students to be successful in the workforce, we as educators have an increasing responsibility to prepare our students to be safe, respectful, and responsible digital citizens. Digital citizenship can be broadly understood as membership and participation in an online community, such as the internet or its various sub area. In this way, being a “good” digital citizen means, as the Digital Citizenship Institute defines it, having “norms of appropriate, responsible behavior with regard to technology use” . One key behavior in the set of good digital citizen norms involves taking sufficient precautions to foster strong personal and community digital security. This goes far beyond telling your students to not talk to strangers online or to not share their personal information on social media sites. Students need to understand the kind of information that is being passively collected from them when they visit or create accounts on websites and what value it has to them, those that want to collect it, and potentially others if it gets leaked or released. Understanding the potential threats that they might face when sharing personal information on any website, including social media sites, is also important. As an example, I’ve taught many students that didn’t know that their photos contained geotags (longitude and latitude numbers) that could be used by attackers to figure out where they live or places where they frequent. Finally, equipping students with the skills they need to be able to identify potential attacks and avoid being a victim of scams, such as phishing and identity theft, is also paramount. Even if you see the value of digital citizenship preparation in your classroom, you may feel like you don’t know where to start or how to tie topics like security and online safety into your existing curricula. Don’t worry! There are many online resources that can help. First decide what cybersecurity concepts you want to teach in your classroom. You can find lists of topics online ranging from social media safety to types of malware to password complexity. The bottom line is there are plenty of lessons and curriculum to choose from. You can even choose to integrate a single lesson, a module made up of several lessons, or even a whole semester or year-long curriculum. To help you move forward, I have listed some of the resources that have helped me along the way as I have integrated more cybersecurity concepts into my classroom. I had the opportunity last summer to teach at a GenCyber Camp hosted by University of Nebraska at Omaha. This camp provided several modules that span a variety of cybersecurity topics. The modules are available online at www.nebraskagencyber.com and have a creative commons license. (Side note) If you’ve never attended a GenCyber Teacher Camp, you should check to see if one is being offered in your state. CyberPatriot – ​​​​The National Youth Cyber Education Program created by the Air Force Association (AFA) to inspire K-12 students toward careers in cybersecurity. You can look at it https://www.uscyberpatriot.org. This entry was posted in Computational Thinking by Kristeen Shabram. Bookmark the permalink. 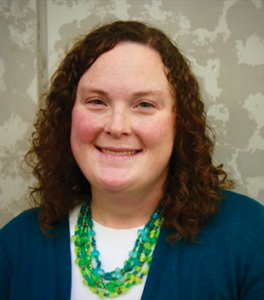 Kristeen Shabram is a middle Business & Technology teacher at Westside Middle School in Omaha, NE. She is currently serving as one of the K-8 Representatives on the CSTA Board.